Five weeks ago, Kazakhstan pulled off an international public-relations coup by luring a whopping 11 Nobel Prize winners to the Astana Economic Forum. Swiss adventurer Bertrand Piccard showed up at a sustainable-energy forum in Astana just three weeks after making a historic solar-powered flight. The 20-hour journey between Madrid and Rabat, Morocco, on June 6 generated world headlines as the first non-fuel-powered flight between continents. Leaders of Kazakhstan’s quest to land an expo in Astana in 2017 were delighted with the luster that Piccard’s presence gave the Future Energy symposium, which tied in to their expo bid. They were also tickled with his statements to symposium participants and the press that Astana would be a good choice for an expo, given the world’s pressing need to switch to renewable energy. “I am not a member of the Bureau of International Expositions, so I don’t have the right to vote” on which city obtains an expo, Piccard said in an interview. But he said he believes energy is today’s most important challenge, so he’d favor an expo with an energy theme. Astana is competing with Liege, Belgium, to host an international exhibition in five years. It would be Kazakhstan’s first expo. Liege had one in 1939. Kazakhstan’s expo theme is “Future Energy.” Liege’s theme, “Connecting the World, Linking People,” focuses on current and future technology connecting people around the globe. Kazakhstan knows that a valuable byproduct of holding such premier events as the 2010 summit of the Organization of Security and Cooperation in Europe and the annual Astana Economic Forums is the international recognition the country receives. It’s also aware that the more star power it can roll out at these gatherings, the more recognition it’s likely to get. At last month’s Fifth Astana Economic Forum, for example, participants included former British Prime Minister Tony Blair and Erno Rubik, the inventor of Rubik’s Cube, in addition to the 11 Nobel laureates. Piccard’s star is particularly bright these days because of his most recent aeronautical accomplishment. He first gained fame in 1999 as a member of a two-man team who were the first to fly a hot-air balloon around the world. Piccard is not only an adventurer is his own right, but boasts an impeccable explorer’s pedigree. His grandfather Auguste was the first person to take a balloon into the stratosphere. His father Jacques was the first to take a submarine to the deepest part of the ocean in 1960. And other family members also were explorers. Piccard told me in an interview that Kazakhstan officials didn’t invite him to the energy symposium to cash in on the fame he achieved in his recent cross-Mediterranean flight. They actually invited him in January, long before the flight, he said. His presence in Astana shortly after the milestone was coincidence – a very happy one for Kazakhstan. Kazakhstan’s invitation came at an international conference that Piccard attended in Abu Dhabi at the start of the year. The Kazakh ambassador to the United Arab Emirates, Askar Mussinov, asked Switzerland’s ambassador, Wolfgang Amadeus Bruelhart, to convey the invitation to Piccard. “He asked me to come – and asked me if I could bring my plane with me,” Piccard said. The adventurer said he’d visit but wouldn’t be able to bring the plane. Immediately after the Solar Impulse made its France-to-Morocco crossing, it was ferried back to its base in Lausanne, Switzerland, so it could be prepared for an around-the-world flight in 2014. The plane’s power on the Morocco journey came from 12,000 solar cells on its wings, which are as long as a Boeing 777’s. Solar-powered batteries allowed the craft to fly at night. You can find out more about Piccard, the Morocco flight and the round-the-world mission at Solar Impulse’s terrific website, www.solarimpulse.com. 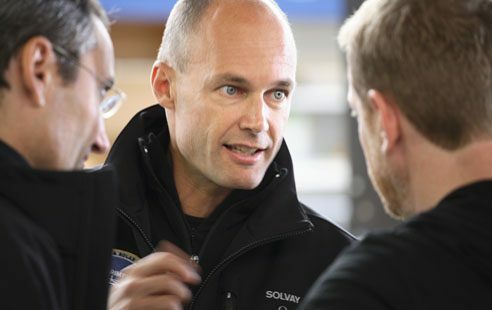 Piccard plans to stop on every continent during his 2014 flight to spread the message that the world needs to make a greater effort to achieve sustainable energy. He tries to do his part, he said, by insulating his home, keeping its thermometer at 20 degrees Centigrade, never using air conditioning and driving a hybrid car. “All of these together make a huge difference” in energy use, he said. Piccard said he’s encouraged that oil-, gas- and coal-rich Kazakhstan has announced ambitious plans to develop renewable energy. In its two decades since independence, the country has become an oil and gas titan. When its giant Caspian Sea development Kashagan begins commercial production next year, Kazakhstan is expected to become one of the world’s Top 10 oil producers. It’s also beginning to develop its huge potential in wind, solar and biomass power. And it’s modernizing a Soviet electricity, gas and heating system that wastes massive amounts of energy. Piccard said he hopes Kazakhstan follows through on its renewable-energy pronouncements. “If Kazakhstan shows the way, then other countries will follow,” he said. If the lineup of sustainable-energy experts that Kazakhstan invited to the symposium is an indicator, the country is serious about renewables. The speakers included Gerd Leipold, former executive director of Amsterdam, Holland-based Greenpeace International; Markus Wrake, head of Energy Technology Perspectives at the Paris-based International Energy Agency; and Jeremy Leggett, founder of the Waterloo, England-based solar-power company Solarcentury. During his speech, Leggett offered as an example of renewables’ potential his company’s installation of solar roof tiles that generate enough energy to power a home and an electric car. He also noted that the cost of renewable energy is falling while the cost of traditional energy is rising. “We are very close to being competitive with coal, gas and nuclear” power, he said. Governments need to accelerate the shift to renewables with policies that both “unlock clean energy’s potential” and “unlock energy efficiency,” Wrake asserted in his speech. Kairat Kelimbetov, Kazakhstan’s deputy prime minister, said in his address that the economics of renewables make sense. Every dollar invested generates a $3 return in greater efficiency and reduced costs, he said. If Kazakhstan lands the 2017 Expo, the site will be powered entirely by renewable energy, Kelimbetov pledged. The key non-energy headliner at the symposium was Vicente Gonzalez Loscertales, secretary general of the Paris-based Bureau of International Expositions. Its 156 member countries will vote on a 2017 Expo city in December. Loscertales said he’s proud that expos have had a 160-year history of fostering sustainable economic growth. They have been “catalysts for the transformation of cities and countries,” he said. Other prominent Kazakhs addressing the symposium included Deputy Minister of Education Murat Orynkhanov, Deputy Minister of Environmental Protection Marlen Iskakov; another deputy minister of Industry, Kanysh Tuleushin; and Rapil Zhoshybayev, executive secretary of the Foreign Ministry and the coordinator of Kazakhstan’s Expo 2017 bid.